Liz's Paper Loft: Guest Designer: Jen! Thanks, Jen, for your FABULOUS project and help during my recovery! Gorgeous card, Jen! Such a sweet stamp, and you paired it with the perfect colors and sentiment! This is so pretty! LOVE the color combo!!! Such a Pretty Card Jen. Hope your feeling better Liz. 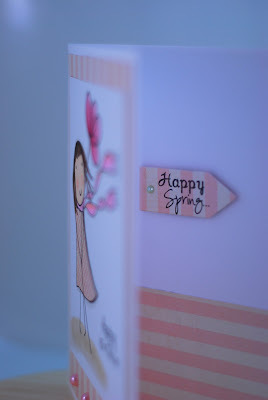 What a pretty card, I love the soft colors you used. Jen ~ What an ADORABLE card! I LOVE it! The colors are so subtle and pretty! Your coloring is just GORGEOUS! I am starting to like stamping more and more too! I think the pictures turned out PERFECT! Great job as guest DT! Liz ~ wishing you well again today! I adore this image. Great card! Super cute card, the colors are gorgeous and sentiments are perfect! Very sweet image and card. I like the pearls. Looking forward to seeing your announcement Liz....hope you are well soon! Adorable. I love that whimsical stamp! Colors are great. I'm an email subscriber of Liz's so have been seeing all the guest designers but am going back through the old posts to see when Liz had her surgery and just had to comment on this adorable card. That little girl is so darn cute!! Love the little pink stripes and the bling! You made such a sweet happy card...the pearls were perfect. 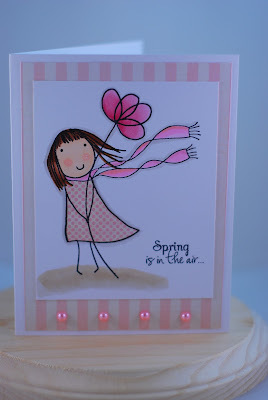 What an adorable card, I really love this image and also your choice of color combo, awesome! cute card! the pearls are a really nice touch. tfs. Monday Hop ~ Two Become One!